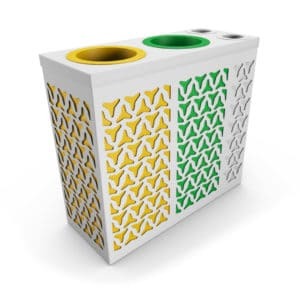 Looking for an attractive and functional solution to your indoor recycling needs? 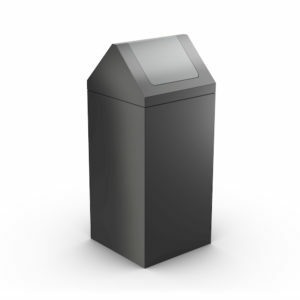 Made of high-quality materials and designed to last and impress, our range of indoor trash cans is just what you have been looking for. No matter which model you choose, you are sure to get a quality product that will make you go WOW! Would you like to renew your stock of indoor trash cans? Urbaniere offers you a wide range of products to meet all your needs. 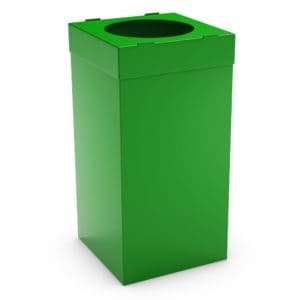 As a leader in the creation of recycling bins for selective sorting, our company is committed to the importance of recycling and waste management. 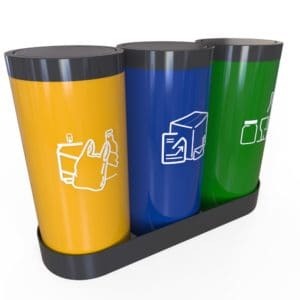 Our range of recycling bins for indoors can be equipped with an informative banner, with different colors, adaptable, for a specific use, and so on. We can also meet your personalization requirements (colors, compartment sizes, for example). Discover here our different models for your interior. 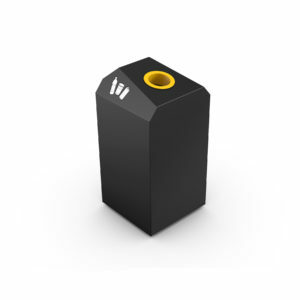 You will certainly find the one that is most suitable for your particular business, tastes, and requirements. Do you want to make your employees aware of waste sorting? The indoor bins with an informative banner indicate to the users the actions to be carried out for a good separation of rubbish. Information banners with symbols are usually more understandable to users, who do not always know the color code of the recycling process. 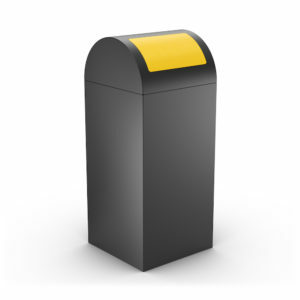 Our Auriga model has information to simplify waste sorting. Logos symbolizing industrial waste, metal, plastic, and so on. Your employees will no longer have any doubts when it comes to throwing away their trash. 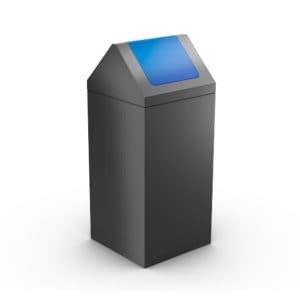 Thanks to our indoor trash cans, all they have to do is let themselves be guided by the engraved symbols. Made of steel, Auriga is a sturdy and robust waste bin with an informative banner. 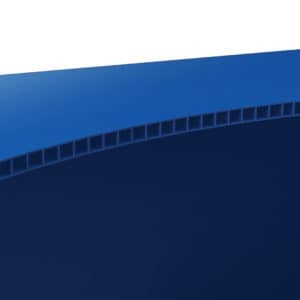 Despite this aspect, you can quickly move it to other collection points thanks to its wheel system. 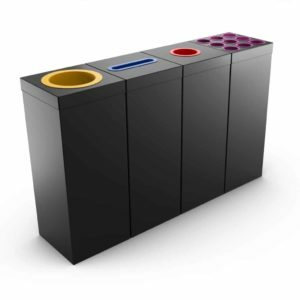 You optimize the separation of waste for improved treatment. 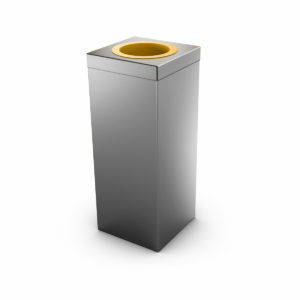 Hygienic and with a discreet and elegant design, this recycling bin is ideally suited to an office or administrative environment. It can be easily located next to your company’s printer or coffee machine. Does your business or local community have special needs? 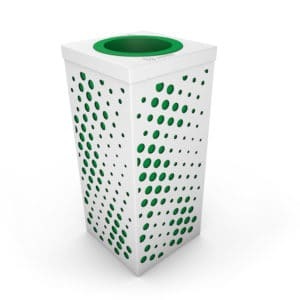 Urbaniere offers you recycling bins for specific uses. 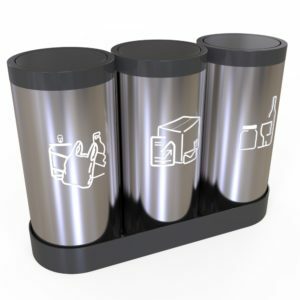 Cans, batteries, cups and cigarettes, we can adapt to all your requirements. Buying an indoor trash can for a specific purpose can meet particular needs. 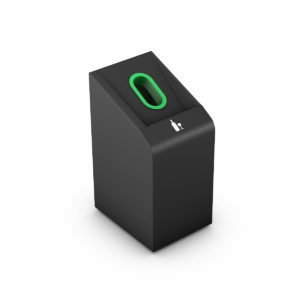 You can install this type of bin in a break room or cafeteria. 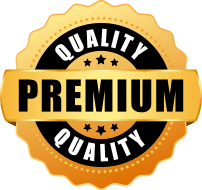 The Premier model is a perfect example of our expertise. 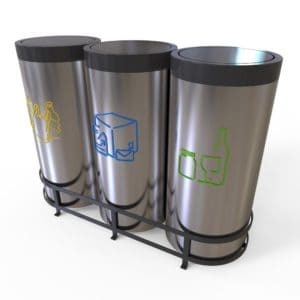 Equipped with two large containers, it also has two small receptacles that can hold cups and cans. 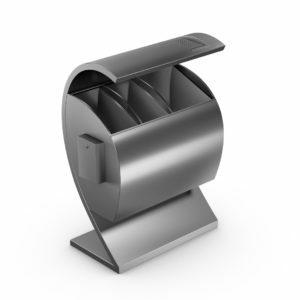 Made of stainless steel, it does not rust and maintains an unbeatable hygienic appearance. 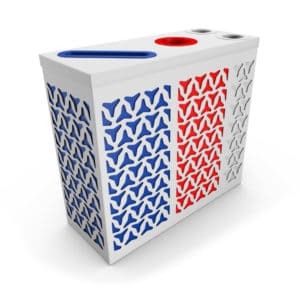 Easy to clean and empty, it is perfect for public authorities and offices. 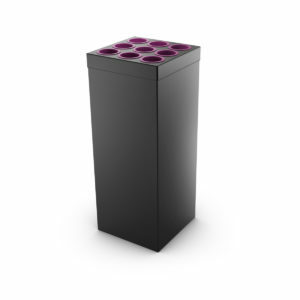 With the Premier recycling bin, you bring elegance and simplicity to your workspace. 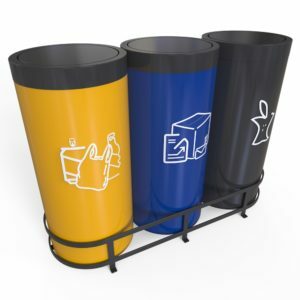 As the two containers allow the separation of paper and plastic waste, it is possible to customize the number, size, and color of the sorting bins according to your needs. 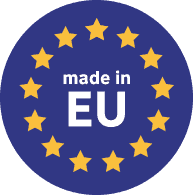 Thanks to this customization, you will be able to better comply with the unique color code implemented in the European Community. Do you have any special requests? Please note that Urbaniere takes into account your requests for complete customization of your recycling bins. We can change the material of the bin (steel, wood, stainless steel, and so on), its color as well as its design (colorful, discreet, and so forth). Your company is sensitive to sustainable development. 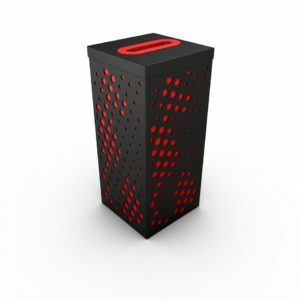 You can choose a bin to recycle in an environmentally friendly material. The decoration of your offices has been designed to be modern and shimmering? 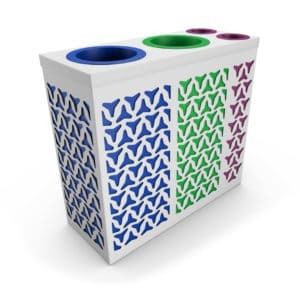 We offer you colorful and original designs for your indoor bins. The capacity of the containers is also adaptable by our teams. Would you like a 200-liter bin? 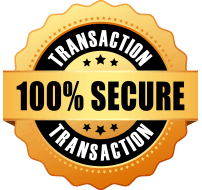 We evaluate your needs in collaboration with you to take charge of your request. 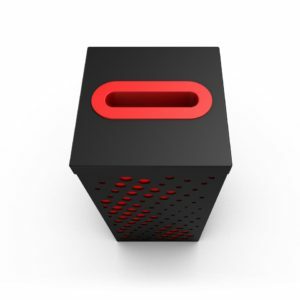 Urbaniere provides you with a quick and precise answer on their technical viability. Please take the time to contact us. We will address your concerns and doubts. Your needs will be evolving, but you don’t know exactly when? 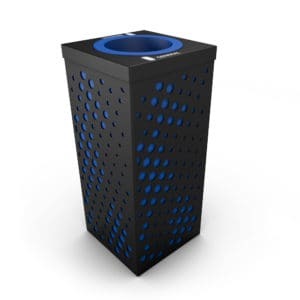 Urbaniere recommends its adjustable interior trash cans. 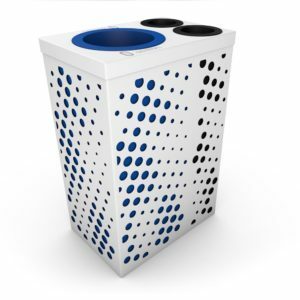 Malmo is an adjustable recycling bin with three adjustable compartments: plastic, paper, and other waste. 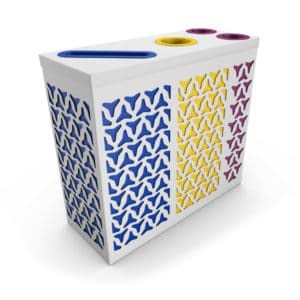 The color of the receptacles and the symbols can be customized. You choose the color and information corresponding to the waste in your business. 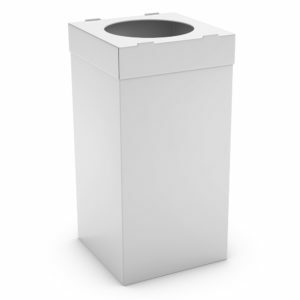 When you use the Malmo bin as a recycling station, you can add or remove one of its components very quickly. 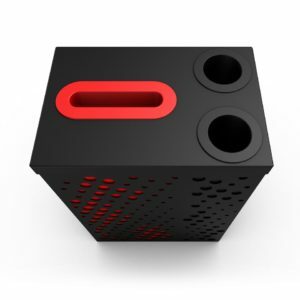 The other everyday use of this product is to distribute the compartments to different areas. For example, the “other waste” compartment can be placed next to the coffee machine for depositing coffee cups. 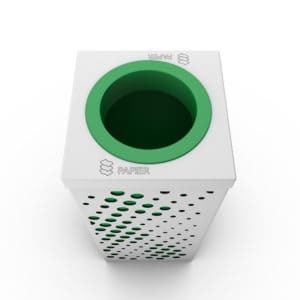 The “paper” container can logically be located near the printer. Thanks to this distribution, you optimize their use. Urbaniere allows you to cross the barrier of the static and not very functional container. The advantage of colored indoor recycling bins is that they are easier for your employees to identify. 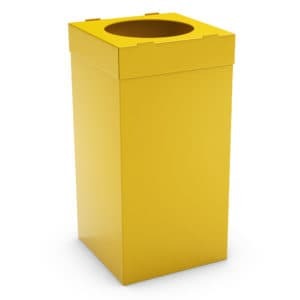 In the European Community, a unique color code tends to be adapted to determine the different compartments of a bin with ease. Even if it is still poorly respected, most of your employees identify the color green for glass, yellow for plastic waste, and so on. What are the other colors used for recycling? Blue corresponds to paper rubbish (newspapers, directories, and so on). Black generally represents organic waste and food scraps. Although it is an unusual color for recycling bins, it can easily be added for the greater comfort of users. Brown and red are mostly for non-recyclable waste. 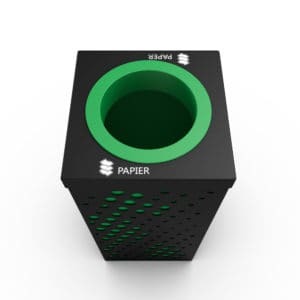 As with the black, it can be installed in a recycling station. 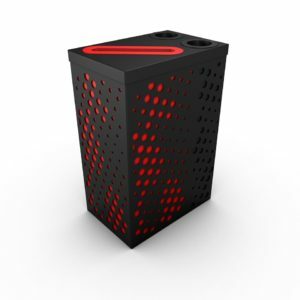 Urbaniere has the four-compartment model, Auriga, which allows the trash to be identified using a color code. 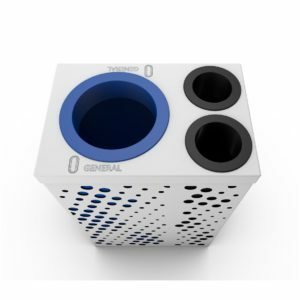 Customizable, these compartments can be of different colors according to your needs. 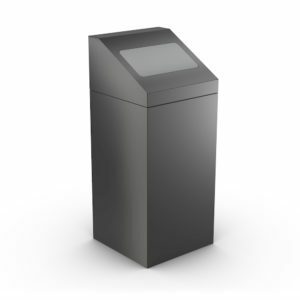 With an anthracite-colored steel frame, the waste receptacles contrast in color. Their capacity can also be customized. Urbaniere offers you the choice between several sizes available. 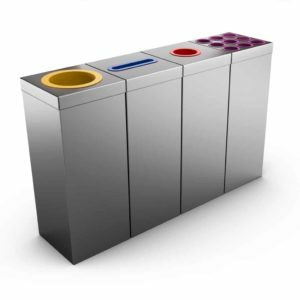 Auriga is a quality recycling bin for controlled waste separation.